I hope you don't mind if I, as a proud father, brag a little bit today about my second son, Blake Goolsby. As you may know, I already practice law in Augusta, Georgia with my oldest son, Ric, and now, my second son, Blake Goolsby, will be joining us, later this summer, at the Goolsby Law Firm! (see here) In other words, my second son, Blake, just graduated from Mercer Law School a week ago. Now, he is studying for the Georgia Bar Exam before he joins us at our family law practice later this summer in Augusta. We are so proud of Blake and all his accomplishments! Of course, I don't mean to overlook my third son, Zachary, who just completed his first year of law school at the University of Georgia, in Athens. 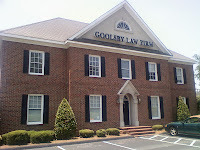 We are proud of Zach, too, and also look forward to him joining us at the Goolsby Law Firm in a couple of years, too! We are truly a family law firm which handles a little bit of everything, including divorces, adoptions, personal injury, and criminal law, in both Georgia state and federal courts. That's all for bragging about my sons today! I hope you understood!